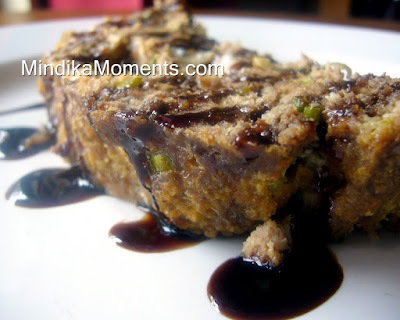 Mindika Moments: Meatloaf...fine dining style! Sorry I missed my Monday Moments yesterday. I had a long day...including a clingy teething toddler that decided a nap was out of the question. As a result I decided she needed me a little more than all the things on my "to do" list. But to make up for my absents, I have some awesome recipes on the schedule for this week. Starting off with an amazing meatloaf! I have my cousin Tabatha to thank for this one. She emailed me a couple weeks ago and asked if I had a recipe for Gorgonzola Meatloaf. I unfortunately did not. I'd never even thought about putting Gorgonzola in meatloaf, but I told her I'd do some experimenting and come up with one. My husband and I both love Gorgonzola, so I knew this would be a fun one. I decided to pare the flavor of the Gorgonzola with other complimentary ingredients, like Dijon mustard, green onions and then top it with a balsamic glaze instead of the traditional ketchup or barbecue sauce. It turned out better than I had expected. I have to say, the richness of the cheese and balsamic glaze turned traditional "comfort food" meatloaf into a "fine dining" quality meal. I served this with my Baked Mashed Potatoes and steamed broccoli. 2. In a large mixing bowl combine all the ingredients except the Gorgonzola cheese. Do not stir until all ingredients have been added to the bowl. 3. Using your hands mix until the ingredients are well incorporated into the meat. 4. Divide the mixture in half. Take one half and form it into long oval/rectangular shape in the bottom of a 9x13 baking dish sprayed with cooking spray. Form a small crater/divot in the middle of the meat. 5. Lay the sliced or crumbled Gorgonzola along the crater down the center. 6. Take the other half of the meat and cover the cheese and top of the meat loaf. Spray the entire meat loaf with cooking spray. 8. When the meat loaf is done. Allow to cool for 10 minutes, slice and serve drizzled with balsamic glaze. 1. In medium sauce pan combine the vinegar and sugar. 2. Bring to a boil, reduce heat to medium high and allow to boil until the vinegar reduces to a syrup. About 5 to 10 minutes. I am definitely trying this! I love how different it is and that balsalmic glaze it the kicker for me! I will let you know when we have tried it!